Using ArcGIS Online as a virtual workspace created a collaborative environment. GIS revolutionized the way the coalition finds information, communicates with each other, and engages participants. 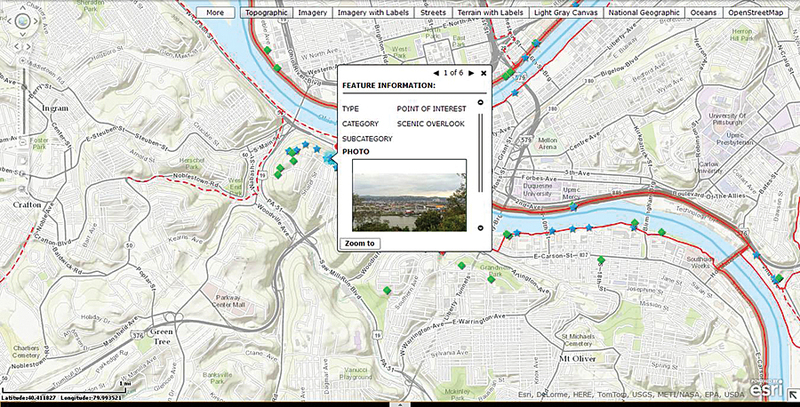 ArcGIS Online included tools to create, annotate, print, and share ideas with all stakeholders. According to the Outdoor Foundation, Americans went on 12.4 billion outdoor excursions in 2012, taking advantage of the diversity and accessibility of the nation’s outdoor opportunities and spending an estimated $6 billion. Nearly half of all Americans participate in some form of outdoor recreation. Most do so because getting outside is a great way to exercise. Biking, running, fishing, and camping are the most popular outdoor activities among all Americans. A significant portion of these activities occur on trails. Trails are both a destination for people who are hiking, biking, jogging, cross-country skiing, or snowshoeing and a means of access for fishing holes, campgrounds, bird watching, and other recreation activities. The northeastern portion of the United States has a significant network of trails that have been developed over the past 30 years, often along abandoned railroad corridors. An extensive network of trails traverses the region’s valleys, mountain ridges, streams, and river corridors. The trails pass by small towns and connect in cities, only to dive back into the wilderness on paths in regional parks. Different trails accommodate varying combinations of activities such as hiking, jogging, biking, and horseback riding, as well as riding all-terrain vehicles and snowmobiles. But the value or utility of trails goes well beyond a recreational aspect. They are a means of connecting people with employment opportunities and other destinations. They bring money into towns along the trails in the form of spending on food, gear, overnight accommodations, and supplies. The Great Allegheny Passage Trail is a 150-mile trail, that has been completed in Pennsylvania and Maryland thanks to years of hard work and tenacity. It connects to a second trail, providing a continuous link between Pittsburgh and Washington, DC. 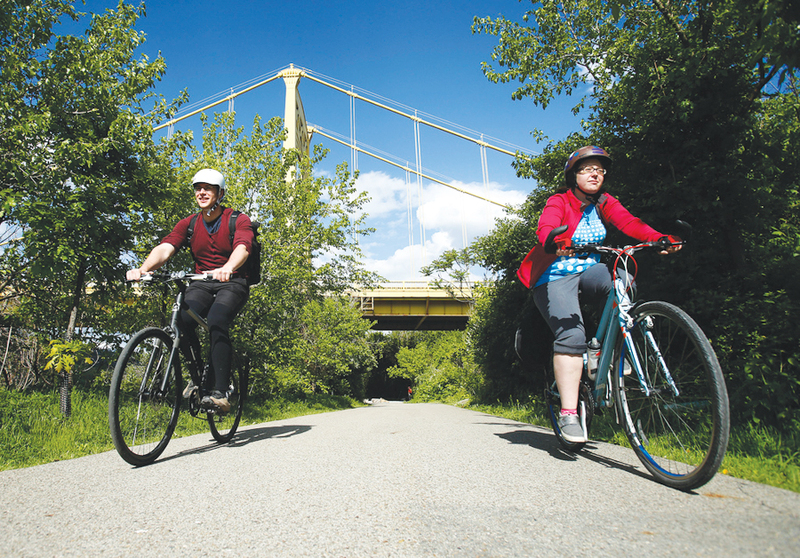 Studies have demonstrated that Great Allegheny Passage Trail users generate more than $40 million in direct annual spending in towns along the trail, with overnight visitors spending an average of $114 a day. Generally, developing trails has been the work of local advocates who focus on building trails in their own neighborhoods. In 2011, the Progress Fund and Pennsylvania Environmental Council formed a regional coalition encompassing 32 counties called Power of 32. As the effort moved forward, project partners grew from the original 32 counties to a total of 52 counties (as of early 2014) in the states of Maryland, Pennsylvania, New York, Ohio, and West Virginia. The coalition is expected to grow through 2014. There are more than 1,400 miles of trails suitable for a wide variety of outdoor activities within the coalition’s land area, although many are isolated segments that do not connect to other trails. The database was expanded beyond trails to include key features, such as scenic overlooks, and photographs. The coalition envisions the formation of a network of multiuse trails that will connect rural and urban communities in the five-state area to improve recreational options for locals while also positioning the region as an international trail destination. This will be accomplished by completing the most challenging but economically beneficial trail connections. A landscape architecture and community planning firm, Environmental Planning & Design, teamed up with the Progress Fund, Pennsylvania Environmental Council, and other trail organizations and state and federal agencies to realize the vision by defining the trail corridors and mapping missing trail sections that need to be completed. Trail builders need tools to plan and prioritize—making key connections and leveraging past and future investment dollars. With the majority of the primary trails in the region already constructed, the key to identifying gaps in the trail system and enhancing the region as a multiuse destination had to focus on data and communication. The project mantra became “explore and share.” It quickly became clear that the project would benefit from a rich platform where data could be shared, manipulated, and studied at each partner’s desktop—rather than in a quarterly meeting. Paper maps were soon morphed into a cloud-based database of trail information. The approach to creating a collaborative environment was to use ArcGIS Online as a virtual workspace. Esri software was the most common platform among the dozens of local government agencies, organizations, and groups participating as part of the coalition, so it was natural to continue on the ArcGIS platform. Furthermore, the wide array of ArcGIS Online features—including base data, aerial imagery, and topographic data—allowed the coalition’s focus to turn to collecting and assembling the most current trail data available into an easily shareable web map. The base data provided by Esri was especially important because, while information like roads was important for context, the only data that needed to be manipulated was trail data. Being able to utilize Esri’s base data as a background enabled the trails database to stay as slim as possible and prevent problems associated with large, cumbersome databases. This was especially useful because of the number of different coalition members who were contributing datasets. Nearly as much time was spent preparing and grooming the data for consistency as was spent analyzing it. The gototrails.com website provides analysis of the trail gaps provided in maps showing where trails are physically disconnected. This database immediately revealed itself as a powerful tool to raise the profile and the use of trails in the region and to assist with advocacy, fund-raising, and collaboration focusing on how to complete and connect the system. GIS technology has revolutionized the way this coalition can find information, communicate with each other, and engage participants. When the project began, the intended audience was a specific group of trail advocates, government officials, staff, and dedicated volunteers who needed data for prioritized decision making. Using Esri’s developer tools, the initial web map was further refined into a web application, Make a Map Toolbox, to create an even more easily accessible and user-friendly planning environment. 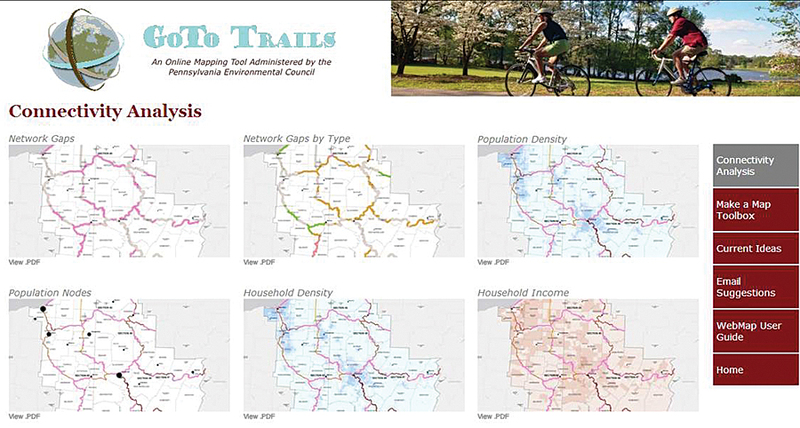 This web application included the tools necessary to create, annotate, print, and share ideas among the trail advocates and the general public. The Make a Map Toolbox acts as a planning whiteboard—increasing understanding and collaboration, creating a consistent plane of data for the coalition members to utilize, shortening review time, solving the problem of distance across five states, and accelerating decision making. It has leveled the playing field in terms of data knowledge and acted as a guide for substantial discussions that truly address the breadth and depth of the issues facing trail connectivity in the region. Technology is allowing people to communicate in real time and reach a level of understanding never before possible when physically separated by distance. The gototrails.com website has been developed to be modular and, as the project moves forward, allow the data in the cloud to reach a wider audience. Trail advocates will be able to utilize data to plan maintenance, make trail connections, and track problems. A mobile trail app will expand this utility and allow the general public—from daily bike commuters to long-distance hikers and local trail enthusiasts—to access trail information in real time—mapping routes, locating amenities, and reporting problems back to trail managers. The power of technology is harnessed to foster and enhance trail communication. It is creating better connections to large and small places through trails—between major US and Canadian cities and rural villages. Andrew Schwartz is the managing principal at Environmental Planning & Design in Pittsburgh, Pennsylvania, a 75-year-old landscape architecture and planning firm focusing on attainable and implementable solutions. Jennifer Cristobal is a planner and designer at Environmental Planning & Design. For more information, contact Amy Camp, Pennsylvania Environmental Council, or Carolyn Yagle, Environmental Planning & Design. This project won a Presidential Award for Excellence in the Communications Category of the Professional Awards Program of the Pennsylvania-Delaware Chapter of the American Society of Landscape Architects.